Four months after DC Comics' Source blog announced the Earth One initiative that promised a new take on the DC characters, published in graphic novel format and with its own continuity, my excitement for the project has both heightened and tempered. On one hand, we learned in March that J. Michael Straczynski, who'll be writing Superman: Earth One, will also be writing an original graphic novel set within the DC Universe, Samaritan X. Since the next best thing to the Earth One graphic novels with their own shared continuity would be graphic novels that share the main DC Universe continuity (I've longer clamored for a Manhunter OGN that ends at the feet of the crossover du jour), Samaritan X is a gigantic step in the right direction -- especially since it's written by Straczynski, who's also taking over Superman and Wonder Woman and, one hopes, might cameo the Samaritan X super-hospital in those titles. An original graphic novel, in mainstream continuity. I'm tempted to think of this as an unprecedented step, that never before has DC Comics produced an original graphic novel that (presumably) fits right in with modern continuity, but it's clearly not the first. Just in brief, Green Lantern: Legacy -- The Last Will of Hal Jordan re-established aspects of the Lantern Corps referenced soon after in the Green Lantern title of the time; Catwoman: Selina's Big Score lead in to that series; Life Story of the Flash set that series' continuity for a while. And that's not to mention all the Prestige Format one-shots that came out over the years that also factored into continuity. Samaritan X, however, is DC's first in-continuity, original graphic novel to arrive in today's comics landscape, where 99% of everything you read will end up as a long-form collection. Consider that one of the last big in-continuity graphic novels, JLA/JSA: Virtue and Vice, came out in 2003 when the current collected edition craze was only just beginning; if Samaritan X were to be super-successful now, when a far greater percentage of the comics fanbase wait for the trade and read their comics in collections, this could indeed spark an era where readers don't have to wait for the trades, but rather some of the day's relevant comics emerge first-run in long form just like Samaritan X will. On the other hand, aside from Samaritan X, other issues give me pause. 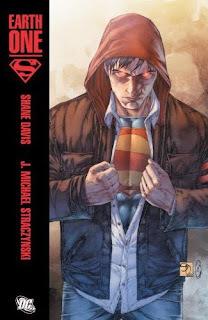 First, I wonder about Straczynski as the writer of both Superman and Superman: Earth One. I state this without really an experience with Straczynski's writing, so this has no bearing on Straczynski himself, but I wonder about the mental gymnastics necessary to write both of these books together. In Earth One, Straczynski has stated, Jimmy Olsen is more of a daredevil, so where does that leave the Jimmy Olsen of the current DCU? If the Earth One Daily Planet will function more like an actual newsroom, what will the current Daily Planet be like? Essentially, if Straczynski gets to create his Earth One Superman mythos from the ground up, by his rules, can his DCU Superman help but pale in comparison? Maybe Straczynski can do it, but when I'm already concerned that it seems like DC's sweeping much of the past two year's New Krypton under the rug with two new writers on the Superman titles, Straczynski's dual roles give me pause. Crisis of Infinite Delays on Earth One? There's also the issue that, at least from fan perception, the Earth One initiative may not be rolling out as smoothly as planned. About the time we learned the relatively reasonable price and page count for the Earth One books, we also learned we wouldn't see Superman: Earth One, until the third quarter of this year -- hardly enough time, it seemed, to release a second volume before the end of 2010. I discussed at the time that DC announcing the book so early risked fans forgetting about the whole thing by the time it came around. And in addition, a September release for Superman: Earth One left very little time for Geoff Johns' Batman: Earth One to follow -- and indeed, Batman: Earth One isn't at all on DC's official list of 2010 collections. I'm so very eager for Earth One to succeed, but if it's not a series, then it's just two new one-shot takes on Superman and Batman; delays, as are suggested here, could kill it. So checking back in with Earth One and DC's original graphic novels, we find a little bit of hope, a little bit of despair. It is worth noting that right behind Superman: Earth One at the end of the year is Marv Wolfman and George Perez's long-awaited Teen Titans: Games -- not in-continuity per se, but another graphic novel, and if Games and Samaritan X and Superman: Earth One all do well, who knows what might be right behind. Can't wait for the original graphic novel wave? Not sure your paycheck can take it? Be sure to add your comment below! For those not in the know, JMS has done scintillating work at Marvel (Thor with Coipel & Djurdjevic, Amazing Spider-Man w/ Romita Jr.), average work (Fantastic Four), and dreadful work (Amazing Spider-Man, Sins Past). Prior to that, he worked for Top Cow doing Rising Stars and Midnight Nation, and, I believe, created and wrote the Babylon 5 tv series. That's an excellent column by Kirk at Weekly Crisis -- unfortunately, it doesn't make me feel better about the situation. Granted, JMS's work on Brave and the Bold with DC has so far been controversy-free, so maybe things at DC will be different. Thing about being a trade-waiter is (for better or for worse), we'll know if things have gone bad long before the story's in our hands. Straczynski only runs into problems when editors get too involved in what he's trying to do (Sins Past), force him to fold his story into some larger crossover (Fantastic Four, Thor, Spider-Man: The Other), or outright force him to do something he doesn't want to do (One More Day). These things tend to distract us from the fact that he does excellent work until editorial decides to mess around with him. His Amazing Spider-Man (up until Sins Past) still stands as one of the best creative runs on that book ever, his short tenure Fantastic Four was pretty good until he left the book during Civil War, and Thor never really even lost a beat despite all of the drama behind the scenes. It's really no surprise that he's doing great work on Brave & The Bold right now, since that book is in large part independent of the wider goings-on of the DC universe. With Superman, I worry less that JMS will have problems with turning out good material and more that editorial will prevent him from doing so. Hopefully they will be content to let him carry out his own plans, which I'm sure will be great, and they won't try to force him into pointless crossovers or into simply doing the kind of stories they want him to do. I understand what you're saying, Marc. I think, however (for better or for worse again) that the realm of comics these days is large crossovers, line-wide events, and editorial mandates. It's possible for a writer to be both good in-and-of-themselves and also tractable to their shared universe -- not only does a "mainstream" writer like Geoff Johns do it, but even an "out there" writer like Grant Morrison can do it. So, I don't know that I let a writer off the hook because they don't like editorial mandates or even "pointless" crossovers; I take that as a fact of the comics industry. I grant, of course, that this is prejudging JMS before he's had any problems or even any issues have come out; I just don't (respectfully) take your explanation as an excuse. The thing is, much of the editorial mandated storylines were still JMS original ideas. And I'm sorry, but Peter being the father of the Sins Past kids doesn't make it any better. If anything, that's worse; JMS, as I recall, even thinks the storyline in general was a bad idea. The Other was another one of those dumb ideas. Also, JMS was fine with OMD originally; the trouble started when the main thing he wanted to do - write out the Stacy kids - was nixed for some damn reason. But irregardless, there was no way to make OMD a good story, so I just forget about it, because I hate the marriage era anyways. Also, I kind of agree that the "editorial mandate" thing is a bit too much of a copout for some writers. In the case of Thor, I can see JMS's argument - Siege is in the process of destroying the Asgard JMS had so meticulously developed and there is no (at least to me) obvious reason the showdown w/Norman Osborne had to take place there. I think DC and JMS will go well together - big name creators seem to have a pretty free hand (Grant Morrison got to send Batman on a time-travelling adventure, Geoff Johns has brought back Hal Jordan and Barry Allen, Greg Rucka get Detective freaking Comics to showcase Batwoman, Frank Miller can't possibly have an editor bossing him around on ASBAR, etc.). Samaritan X and Superman: Earth One should be free of editorial interference in terms of line-wide events. Superman, likewise, will probably be event-free for quite awhile, as JMS is coming in after the big May event (War of Krypton, World War Superman, whatever). One would imagine they'd go the way of the recent Siege and Blackest Night crossovers and just spin off a separate book if they need a Brightest Day: Wonder Woman or Superman story. Further, to what dl316bh wrote, one rarely hears television writers complain that they didn't get to write their vision of a show; it's understood that a television show is a group project. I think this is a misunderstanding of modern comic books; JMS (or another writer) isn't writing Superman, per se, but one aspect of the DC Universe as a whole. Bob, I think you're right that Superman (and likely Batman) will probably be more self-contained when both their big events settle down. I just hope self-contained still means relevant; even as War of the Superman won't be as line-wide as I had thought (like Blackest Night), I'd still like to see Superman get "the Green Lantern treatment" at some point in the DC Universe. I´m really interested in these two EO Graphic Novels. Hope they don´t take too much time to see the light. I didn't mean to use JMS's frequent conflicts with editorial as a copout or excuse for every bad thing he's ever written. I think he has legitimate reason to be angry when editorial pushes him one way or another sometimes (like in the case of Siege), but it's always been a weakness of his that he gets bent out of shape pretty much EVERY time he's told to do this or that. The whole reason for having editors, in my opinion, is to get the best work out of everyone working for them, and for that to happen the editors do actually have to exercise their power some of the time. I guess what I meant to say about JMS's upcoming work on Superman is that I hope he and his editors are already in agreement about what's going to happen with the character, so they don't get into conflict over it a few months from now...because as I think we all know, the second JMS starts to feel like he's being strung around is the second he's going to quit the title. @Bob: I haven't gotten a chance to read Brave and the Bold yet, but from what I hear it's the kind of book you describe; a big name creator getting free hand to tell stories with the characters, in this case JMS and any characters he wants to work with. From the rave reviews, it sounds like it works. So I do hope he's given some free reign on Superman. Though I think he will. As to Thor... yeah, he had a point there. But this is more indicative of Marvel in general right now though. Whatever Bendis wants, Bendis pretty much gets because he basically runs the direction of the line due to how well his books sell. He wanted Asgard in Seige, so... JMS quit. Yeah. Not a great tradeoff. @Marc: What's odd about this sort of behavior is that JMS isn't even just a comic writer. The guy has written movies and even been in television as recently as a year or so ago, which is more of a group project, as Collected Editions pointed out. Perhaps JMS wants comics to be his avenue away from that; to tell stories more akin to what he wants to do. Either way, JMS will probably get to do most of what he wants on the title. DC was willing to do an idea like New Krypton, so I think they'd be willing to fly with what JMS would want to do for a while. I wouldn't be surprised if JMS uses Earth One for a place for his more "not main continuity friendly" ideas, though. I write this from a bit different perspective from most in that I am not a huge fan of JMS. While I did and do regard Babylon 5 as one of the greatest SF TV series ever, I've not been so impressed with his comics work, partly because he does not seem to play well with others' characters, in that he seems to forget that they are not "his" characters to do with as he wills without regard for the wider universe they are part of. And while I admittedly can't read everything out there, I have been surprised until now to see no concern over what collectededitions calls the "mental gymnastics" required to keep two different versions of a character distinct while writing them concurrently. That gave me pause the moment I read that he was taking over the main Superman title. I hope that there is no bleed between the two; my preference would have been to let him have E1 where he has much freer rein and get another writer for the main title. Just some random thoughts. Maybe one problem will be a solution to the other, as dl316bh suggests. Could be JMS can do what he wants on Superman: Earth One, and that'll temper any conflicts in editorial mandates on the main book. Then writing Superman in two different worlds will be a boon; here's hoping. Given that Geoff Johns was named a higher-up at DC, does that excuse the relative disappearance of Batman: Earth One from DC's radar? Are you all surprised, or do you give it a pass? For me, the Earth One concept doesn't work unless there's two titles; otherwise, Superman: Earth One comes off as just another Birthright, even if a multi-volume one. And here we've been calling these books Character: Earth One; will the second volumes have different titles, or will it be Superman: Earth One Volume Two? Inquiring minds wonder (or wander). A bit off topic, but the cover reminds me of a Tekken artwork. The hood gave Supes that classic Jin Kazama feel. The cover art is definitely an eye candy! I imagine the second volumes of the Earth One books having subtitles rather than the Vol.2/Book 2 approach; more like movie sequels. As for the apparent disappearance of Batman: Earth One, I just think DC announced them too soon. It could appear as early (I use the term loosely) as Jan. 2011. If it's not at least Q1 2011, though, then DC definitley jumped the gun. Given how late Superman: Secret Origin has been, I wouldn't expect Batman: Earth One to be released anytime this year. I think Gary Frank will need a lot more than 6 months to do a 100-plus page graphic novel. Personally, I think JMS' Superman work will be fine. He's coming in at a time when the main character of the book has just come off of a huge event in his life. He did the same thing several years ago with Spider-Man, as he came in after Mary Jane had just left Peter. Similarly, Superman has to live on Earth again after spending so much time on New Krypton. What happens when the world's most powerful man comes back? Here's hoping he can answer that question. I hope that will be the question JMS answers; my concern is that DC will sweep New Krypton under the rug in favor of a new direction, and not give the past two years the weight they deserve. That's my concern from solicitations, however; I understand of course that we won't know until the books come out.